Give your back patio a touch of sophistication with the Santa Fe fire table. Features like a pennyvein finish, deep black fire glass, uniform square shape, plus matchless ignition and safety shutoff come together for equal parts style and function. Put the lid on the Santa Fe for a nice patio table; when you're ready to gather around the fire, take the lid off and ignite the flames. The Santa Fe is perfect for summernight s'mores, lounging on the patio, or even some extra eating space for a backyard barbecue. Complete your patio style with the Santa Fe fire table. Create custom table configurations with the Brayden Modular Fire Table. One, two, three burners, it's up to you! Pair multiple Brayden Modular Fire Tables for endless options. It generously emits 30k BTUs of heat to your seating area, giving you the perfect resting spot while you star gaze, entertain, and dine outdoors. It features a convenient control knob to adjust the settings as needed and extinguish instantly. Say goodbye to lingering smoke! The smokeless and odorless flame is fueled by an external propane tank and may be set up to 10 feet away from your fire table. The Brayden Modular Fire Table is a magnificent addition to any outdoor area and can be customized to fit your outdoor needs. 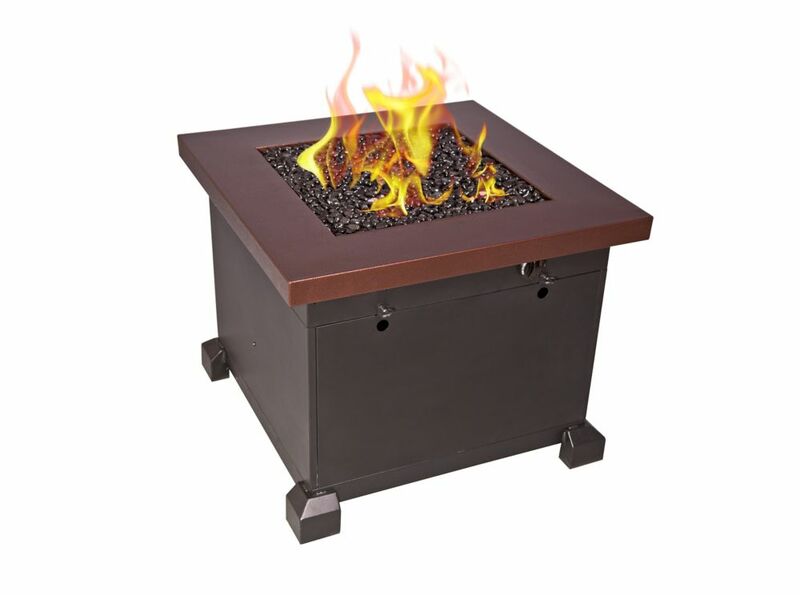 The Atlantis fire pit has it all: a unique ceramic tile top, a stamped reed pattern on the side panels, and 30,000 BTUs with an adjustable flame setting. The propane tank (not included) is cleverly tucked away in the base of the unit. Start the unit with the simple turn of a knob. Then enjoy long, lingering nights with friends and family watching the amber glass rocks give off a warm flame effect. Tired of inhaling smoke around a wood burning fire pit? Breath fresh air and relax under the stars with your Lockwood Gas Fire Table. Power it up with just the turn of a knob and adjust the flame to the perfect height. The hidden propane tank (not included) makes the the fire table feel like part of your patio set instead of an appliance in your backyard. Its 30,000 BTUs of heat will help you enjoy your outdoor space until late fall or beyond. The slick glass table top adds a reflective quality to the table while highlighting the included blue glass rocks. Santa Fe Fire Table Give your back patio a touch of sophistication with the Santa Fe fire table. Features like a pennyvein finish, deep black fire glass, uniform square shape, plus matchless ignition and safety shutoff come together for equal parts style and function. Put the lid on the Santa Fe for a nice patio table; when you're ready to gather around the fire, take the lid off and ignite the flames. The Santa Fe is perfect for summernight s'mores, lounging on the patio, or even some extra eating space for a backyard barbecue. Complete your patio style with the Santa Fe fire table.